Typhoon Koppu ploughed slowly across large swathes of coastal and farm lands in the north-eastern Philippines yesterday, forcing thousands to flee their homes. Officials said a 14-year-old boy died when a tree, uprooted as the typhoon blew ashore, fell on a house in Quezon City, metropolitan Manila's most populated district. At least eight people were reported missing. Rescuers were sent to the rice-growing province of Nueva Ecija, 100km north of Manila, where rivers burst their banks and inundated several low-lying villages. Two bodies were spotted floating in one village, Governor Aurelio Umali told the television network ABS-CBN. More than 15,000 people in towns prone to flash floods and landslides, and coastal villages at risk from destructive storm surges, fled to more than a hundred evacuation centres, the Social Welfare Ministry reported. 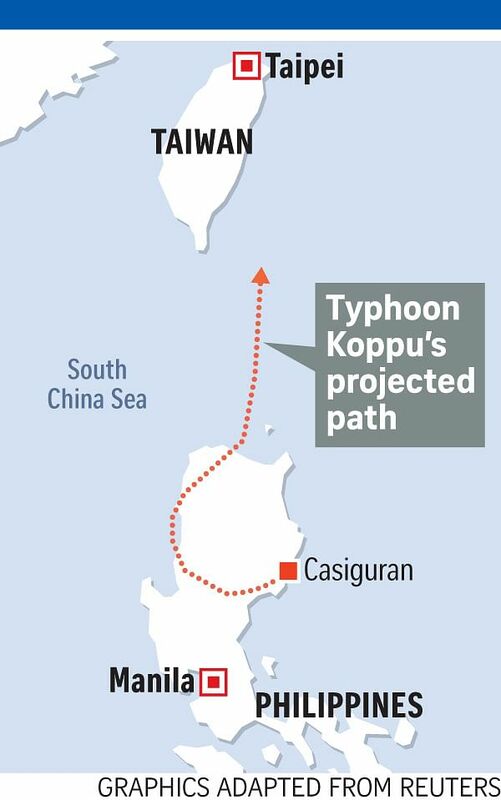 The slow-moving Koppu made landfall near the remote coastal town of Casiguran, Aurora province, 215km north-east of Manila, just past 1am yesterday, with gusts of up to 240kmh. It toppled trees and knocked out power and communications across the main island of Luzon, home to half the country's population of 100 million. At least 22 highways and bridges were cut off by heavy debris, mudslides and overflowing rivers. Fierce winds tore roofs off flimsy shacks. Photos posted online showed hundreds of houses in the worst-hit provinces submerged in flood waters. A coast guard tugboat was deployed to tow a wayward barge carrying coal and 10 crew members that drifted dangerously close to a breakwater in Manila Bay. Hemmed in by the Sierra Madre mountain range, a high pressure area north of Luzon and another typhoon far out in the Pacific in the east, Koppu weakened slightly and slowed almost to a stop after hitting land. It then blew westwards and further inland, hovering over Nueva Ecija for hours with gusts of up to 185kmh, before picking up speed and veering northwards. By dusk, the weather had begun to improve in some towns in Aurora, where villagers began clearing roads of fallen trees and debris. Officials warned, however, that Koppu still packed a ferocity that could set off landslides and flash floods. "It is still typhoon intensity… There is still danger. We shouldn't be complacent," acting weather bureau chief Esperanza Cayanan said at a news conference. Weather forecasters said the typhoon could linger until tomorrow and dump as much as a metre of rain before heading for Taiwan on Wednesday. Mr Alexander Pama, head of the national disaster council, told reporters: "I must emphasise that this is just the start. People must remain alert while we try to pick up the pieces in areas already hit." He urged the authorities to forcefully evacuate villagers in landslide- and flood-prone mountain villages still in Koppu's path in the north. Appearing on nationwide television as the typhoon approached the country last Friday, President Benigno Aquino said about 71/2 million people would need relief assistance. Koppu, Japanese for "cup", is the 12th storm to hit the Philippines this year. An average of 20 storms and typhoons each year batter the archipelago, one of the world's most disaster-prone countries. In November 2013, Typhoon Haiyan, one of the most ferocious storms on record to hit land, barrelled through the central Philippines, levelling entire towns and leaving more than 7,300 dead or missing.